H. Rick Bamman - hbamman@shawmedia.com McHenry County College students in the advance pastry class practiced writing in chocolate. before applying the writting to a Opera Torte. H. Rick Bamman - hbamman@shawmedia.com Advance pastry student Abigail Hanson of McHenry rushes Opera Tortes to the freezer for setting during a recent class. McHenry County College has been adding a few new programs to its offerings including baking and pastry management, paralegal studies and health information technology. H. Rick Bamman - hbamman@shawmedia.com Advance pastry students Emily Shepley (l) of McHenry and Grace Farris of Greenwood disscus the recipe for a ribbon sponge cake during a recent calls in the culinary classroom. 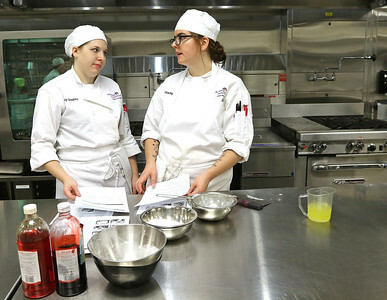 McHenry County College has been adding a few new programs to its offerings including baking and pastry management, paralegal studies and health information technology. 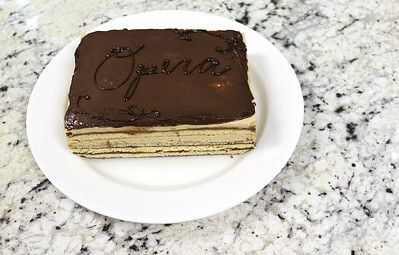 H. Rick Bamman - hbamman@shawmedia.com An Opera torte is a classic torte created in Paris, made of thin layers of sponge cake with a coffee buttercream and chocolate ganache made by McHenry County College students in the advance pastry class. 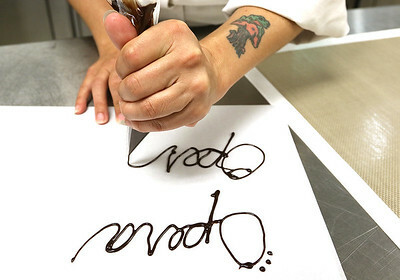 McHenry County College students in the advance pastry class practiced writing in chocolate. before applying the writting to a Opera Torte.